Tanzania are through to the next round of 2018 World Cup qualifiers, despite losing the second leg of their preliminary round tie 1-0 in Malawi. 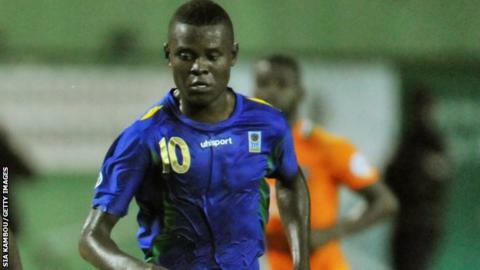 The Taifa stars went to Blantyre with a 2-0 advantage from their home leg on Wednesday to go through 2-1 overall. Malawi got back into the tie with a goal from John Banda in the 43rd minute of the return leg on Sunday. But the Flames failed to score again, resulting in their elimination from the 2018 World Cup. Goals were also hard to come by for Tanzania whose TP Mazembe duo, Mbwana Samatta (pictured) and Thomas Ulimwengu had given the visitors a useful cushion in the first leg in Dar es Salaam. Tanzania face a difficult fixture in the next round of qualifying. They will take on Africa's top ranked side, Algeria, as they continue their bid to reach Russia in 2018. The result piles more pressure on Malawi's coach, Ernest Mtawali who was appointed at the start of August. Also on Sunday, Ethiopia hosted Sao Tome e Principe, overturning a shock 1-0 deficit from the first leg to win the return leg 3-0 and go through 3-1 on aggregate. Ethiopia wasted no time as they began their comeback, with Dawit Fikadu scoring for the hosts after just one minute. A penalty from Gatoch Panom in the 49th minute gave Ethiopa a 2-1 lead in the tie, and Deng Ramkel Lok made sure of Ethiopia's win with a strike in the 75th minute. The reward for Ethiopia is a fixture against Congo Brazzaville in the next round. In the other fixture on Sunday, Kenya were held 0-0 at home by Mauritius in Nairobi but still progressed 5-2 on aggregate. The Harambee Stars failed to capitalise on their goal haul from the first leg but had already done enough to secure their place in the next round where they will face Cape Verde.